My regular readers know I keep writing on this blog: you didn’t marry somebody dumb. Your spouse has good ideas. So do you. The whole idea of marriage is we have a male and a female, we have different brains, we look at the same thing and see something different, we have a built in checks and balance system. Yes…this can be irritating! But it is also a blessing, people! Really! 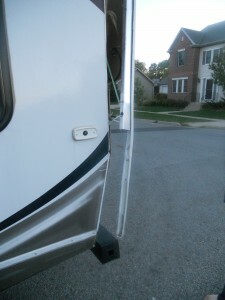 So, ah, well, ah…My wife and I bought a new RV last summer, a travel trailer. We’ve camped our whole married life: the first 19 years in tents, the next 18 years in the back of our full size van (we had two over those years). With the kids grown and grandkids, hey, it was time to upgrade. What fun! 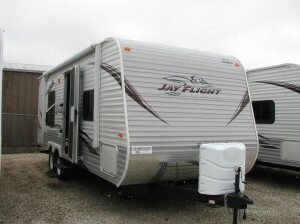 We had a ball shopping for an RV and finally settled on a very nice one. We both loved it (it was a 28 foot Keystone Bullet, rear living unit). But it came with a cautionary request from my wife. She thought we needed to get a trailer dolly, so I didn’t run the trailer into the fence of the secure storage area where we park it. A trailer dolly? They are really expensive. And I’m only one generation away from the farm. I know how to park a trailer. It’ll be fine. No, she’d say. Really. Let’s get a trailer dolly. I don’t want you running into that fence where we store it. It’s over a thousand bucks, I’d say! I’ll be fine. Back and forth we went on that several times. I thought, yeah, a trailer dolly would be nice, but they are really expensive and I think I can do this. We didn’t buy a trailer dolly. We used our 28 foot trailer three times. It was great fun. We loved it. Our kids loved it. Our grandkids loved it. Her mother loved it. My aunt and uncle loved it. My sister and brother-in-law and my brother and niece loved it. Then after the third camping trip I took it to the fenced in lot to store it. I thought I’d pull it in a little to the right. When I pulled to the right, the back end of the trailer (over 40 feet away from where I was sitting) went to the left. On the left was the trailer gate. At the top of the gate was a bolt. The bolt grabbed a hold of the corner of our new trailer and decided to hang on to it. I didn’t know the bolt was grabbing onto our trailer so I kept driving. My wife was standing right there. You’ve got to be kidding. I’ve ruined our new trailer. Oh, brother…if only I’d taken my wife’s advice. If only. The bolt on the fence grabbed a hold of the lip on the corner of the trailer and ripped the two apart. This picture doesn’t give the damage justice, but at least you can get an idea. 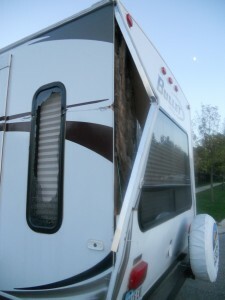 The bolt on the fence not only ripped the left side of the trailer from the back, but also damaged the slide out. You can see the bolt mark about a foot from the top of the trailer. The labor bill alone was $12000. They would have had to replace the whole 28 foot wall and the front of the slide out and the whole back wall. These fiberglass laminated walls can’t be spliced. The insurance company decided to total the whole thing out! Just like that, we don’t have an RV travel trailer any more. How do I apologize about a thing like that? We were both sick about it. Still are, frankly, and that was last September! It took a couple of months, but we finally decided to buy another trailer. This one was a little smaller and lighter and, hopefully, a little more manageable. We take delivery next week. But first…we had to order our trailer dolly! YES. I have relented, willingly, freely, with abandon. She was right. I had to learn the hard way! Here’s a pic of our new Parkit360, freshly arrived from Ontario, Canada! 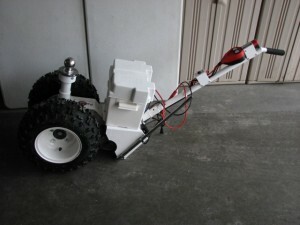 The Parkit360 runs on a battery and electric motor. I can wheel our new trailer without fear now! We pick up our new trailer next week. Here’s a view from December when we first purchased it. This trailer is 6 ft shorter and 1300 pounds lighter than our other one. Here’s hoping I manage it better! Our trailer dolly and new Jay Flight travel trailer will be a regular reminder to me to take my wife’s ideas VERY seriously! Here’s hoping you don’t have to learn the hard way like me!